This issue is not dated early in the year like the past issues. It seems like every time I was ready to publish, I held off for a new development. Then we got really busy with overseas travel and time passed quickly. The big seminar news is that we have revived the two day seminars for 2010, completed this year in America and Australia and upcoming in Dublin, Ireland. Our decision was based on demand for the 2 day format. We have not yet set a domestic schedule for 2011 but Australia is booked, March 5-6 in Brisbane and March 12-13 in Perth. Why these venues? Our "sold out" seminars in both Melbourne and Sydney created demand in other locations. If you register as a Member on www.adhesion.com, you will automatically be notified when we post any new seminars. The Day 1 program is bondodontic subjects that I have taught for many years, although now updated in many ways. For example, I have developed an updated bite-form technique for placing posterior composites. Unlike the old days where we used a self-cured flowable composite, the new technique uses all light-cured products. We first convert a class II into a class I by building a marginal ridge. 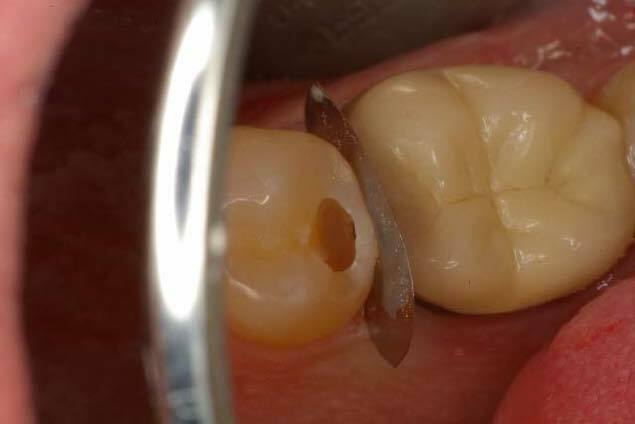 After adjustment of the occlusion on the marginal ridge, we fill the remaining class I by bite-forming the composite. While this sounds fool proof, it is not. The class I has a very high "C-factor" so the filling technique is critical. This new bite form technique is faster than the old technique but demands more careful attention to detail. The Day 2 program is a very up to date presentation on dental materials and techniques, including the new ceramics and porcelain veneers. Included is Cerec and how to get optimal bonding results while saving time. We also have a great Yosemite program planned for the last weekend of October (October 28-30). This one features Professor Junji Tagami who is Fusayama's successor at Tokyo Medical and Dental University. This is a rare opportunity to hear Tagami whose lectures are highly sought after worldwide. To view the details, please click on Upcoming Seminars on our home page. For this issue Dr. Mark Malterud from Minnesota wrote a guest section on "Hydro-abrasion". Mark has a lot of experience with air abrasion and was a Beta tester for the Danville hydro-abrasion unit. I have posted some thoughts about bonding agent selection, mostly from the Day 2 program. Have a great 2010. Stay Bonded! The cornerstone of Minimally Invasive Dentistry has been the use of air abrasion for preparation and surface texturing for resin bonding or glass ionomer placement. Due to the messy nature of the process of accelerating aluminum oxide particles at a tooth, the concept has come and gone various times throughout history. Those of us that wouldn't bond a tooth without first using air abrasion have dwindled over the years. Years ago I was taught by Dr Bill Mueller at one of Dr Tim Rainey's courses at the Texas Institute for Advanced Dental Studies that if you had your assistant simultaneously spray a warm water and air stream at your aluminum oxide stream that the plume of the particles would be cut down to virtually nothing. When I tried this, I found not only did the plume cut down, but I could cut further into the tooth with less discomfort for the patient and my cutting pattern seemed to be more efficient. I can't quantify this efficiency of cutting but will leave that up to the manufacturers that bring this technology forward. What I can say is that this worked very well. One of the drawbacks was that if you had a long procedure, your assistant's thumb would get tired from pushing the air water syringe buttons. Many times we had to stop procedures midway to give her thumb a rest. This inefficiency alone had me looking for systems that merged water and particles into the same stream. A very large expensive unit came on the market back in 2005 from AMT but having no available floor space, this wasn't an option for me. There is also a unit from Velopex called the Aquacut Quattro that was smaller than the AMT unit but still had a larger cabinet top footprint that took up too much space. They also had a cart system that could be used. The Quattro has disposable tips that are used with the unit and the old sickle shaped tips that had a plastic shroud around them to carry the water. The nice part of the Quattro was a dual chamber for two types of abrasive. Not until recently was I able to use the new Danville Hydrobarasion unit that is a small tabletop unit that delivers a consistent flow of not only aluminum oxide particles but a consistent and focused water stream . This unit is so far the best that I have seen to satisfy the needs of my practice and could only be eclipsed by a system that plugs directly into an existing dental control unit delivery system. There is the RONDOflex from Kavo that satisfies the plug and play desire that I suggested but its cutting efficiency and ergonomics don't satisfy the demands for full cavity preparations so I was only able to use it for pre bonding surface preparation. 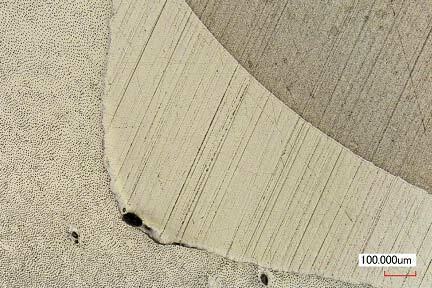 The term hydro abrasion itself is as much a misnomer as the term air abrasion is. Neither one of them uses water or air to abrade a tooth. Aluminum oxide particle acceleration is the source of abrasion and compressed gas is the propellant. 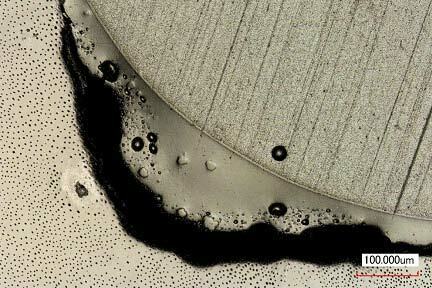 In the process of "hydro abrasion" the difference is that the particles are accelerated along with a spray of water. This combination of a spray of water and particles allows the user to not only keep the particles from bouncing all over the patient, operators and operatory but also keeps the surgical site free of extra debris. The Danville handpiece has a circumferential water stream around the centered aluminum oxide particle stream which keeps water around the dry particles. Moisturizing the particle stream accomplishes multiple enhancements to the use of particle abrasion. Not only do you keep the scatter of dust down to a minimum but moisturizing the tooth during the delivery of the dry particles keeps fluids within the open dentin tubules from being drawn out of the tubules and reduces the level of sensitivity that this causes. A distal carious pit and interproximally involved surface that allowed us to preserve the peripheral rim of enamel that imparts strength of the occlusal surface of the tooth. Procedures conducive to the use of hydroabrasive technology include all of the procedures that air abrasive technologies have provided us in the past only with greater comfort and a cleaner working environment. The following case illustrates the use of hydroabrasion utilizing Danville's PrepStart H2O unit. There is no need to throw out your original PrepStart. 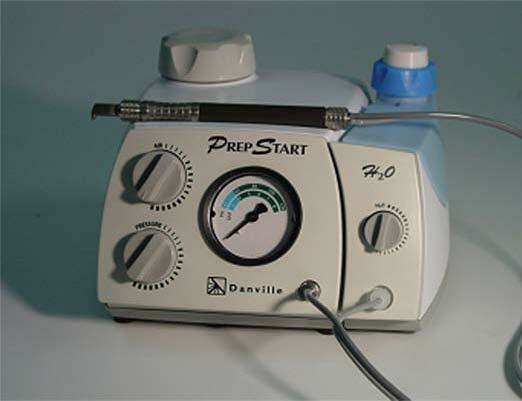 Danville offers a conversion kit to change your original PrepStart to a hydro-abrasion model. Installation is easy, you most likely can do it yourself. Our practice uses HealOzone most often for desensitizing teeth. We have had some remarkable successes that have been presented in our seminars. Also we use it in synergy with Fuji Triage (known as Fuji VII overseas) to enhance re-mineralization of carious dentin. Again we have seen many remarkable successes. Geoff Knight, one of our guest lecturers and a favorite discussion partner, has made some very interesting observations about the effects of ozone on treated tooth surfaces. In the example below, Geoff demonstrates the difference in dentin surface after four weeks in a chemostat with s mutans and l acidophilus. (HealOzone, left, untreated, right) It appears that the ozone treatment prevents re-colonization of bacteria on the treated surface, facilitating re-mineralization. Many of you have been asking about the FDA status of the HealOzone unit. As of now, it remains unapproved for sale in theUSA but the work continues toward getting approval. I find it quite amazing that for a technology with not even one reported adverse response, widely used in Europe, Canada, and "down under", we still have no approval. (Is this really a surprise when the government gets involved?) Regardless, HealOzone continues to work very well in our practice. We at Danville have been aware of research by Van Thompson et al. that suggests sandblasting the intaglio indirect restorations that are comprised of zirconia with Al2O3 powder can create weakness in these crowns or substructures. That weakness could in theory contribute to fractures resulting from occlusal loading. Professor Thompson has stated to Danville: "Since we see few frame work failures with ziconia, sandblasting with low pressure seems reasonable." Professor Mathias Kern et al. in Germany have shown in a series of papers that 50 micron Al2O3sandblasting followed by Panavia bonding is strong and durable. Furthermore, CoJet (3M/ESPE) sandblasting with modified 38 micron Al2O3powder at 40 psi is widely reported to be successful with zirconia bonding. In conversation with Michael Miller, Editor of Reality, he stated, "I don't believe that sandblasting ceramics (if done properly) causes any damage to the surface that would result in failure. The factors that affect this are the type of tip (inside diameter), distance from the ceramic, particle size and how long the treatment is applied." Reality's research on Bisco's Z Prime seems to support safe use of Al2O3 powder in surface treatment. This study shows use of 50 micron powder at 70 psi will produce the best results when coupled with the Z Prime. Al2O3 particles should be 50 micron or less. Air pressure should not exceed 45 psi. CoJet or similar substances used as bond enhancers can be used per the manufacturer's recommendations. The Gluma formula contains HEMA and glutaraldehyde, a very powerful disinfectant. Based on microbiological considerations, Dr. Rella Christensen has been strongly recommending the use of Gluma or a clone prior to placing the bonding agent, for both direct and indirect restorations. This concept makes a lot of sense to me. Just keep the Gluma off of soft tissues and be sure to use eye protection. Now that the Gluma patent has expired, Danville is offering MicroPrime G, a Gluma clone, at about 80% price reduction compared to genuine Gluma (Heraeus Kulzer). The other MicroPrime formula, Microprime B is still available. It uses benzethonium chloride rather than glutaraldehyde for disinfection. Since HEMA is the active desensitizer, both B and G seem to work well for desensitizing, as well as disinfection before placing bonding agents but Dr. Christensen definitely prefers G. From what I know, there is no adverse effect on bond strength resulting from using either formula prior to applying the bond. With some bonds, especially those using phosphoric etch, the dentin bond increases. Microprime B has the advantage that it does not burn soft tissue. In the Buonocore Memorial lecture in 2003, Van Meerbeck and colleagues stated "...the data presented confirm that conventional three-step etch and rinse adhesives still perform most favorably and are most reliable in the long-term. Nevertheless, a self-etch approach may have the best future perspective" 1. Now, about 7 years later, self-etching primers have mostly displaced etch and rinse systems to reach a market share as high as 85% in some countries. In harmony with 2010 market acceptance, Van Meerbeek and colleagues currently state2: "When bonding to enamel, an etch and rinse approach is definitely preferred, indicating that simple micro-mechanical interaction appears sufficient to achieve a durable bond to enamel. When bonding to dentin, a mild self-etch approach is superior, as it involves (like with glass-ionomers) additional ionic bonding with residual HAp. This additional primary chemical bonding definitely contributes to bond durability. Altogether, when bonding to enamel and dentin, selective etch of enamel followed by the application of the 2-step self-etching adhesives to both enamel and dentin currently appears the best choice to effectively and durably bond to tooth tissue." In addition to the obvious simplification in clinical procedures, it appears that a major part of the trend toward self-etching primers is due to the well known fact that self-etching primers are far less prone to result in post-operative sensitivity than are etch and rinse systems. 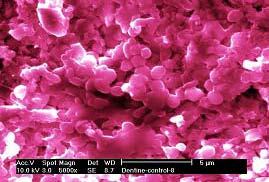 Another compelling but less known reason to use self-etching systems is better dentin bond stability3. Current thinking is that the self-etching primers, unlike typical etch and rinse systems, do not demineralize dentin deeper than can be completely hybridized with infused primer and bonding agent. Overetched and unhybridized dentin is a source of nanoleakage, with ingress of water that is thought to cause hydrolytic breakdown of the demineralized layer, resulting in bond instability. 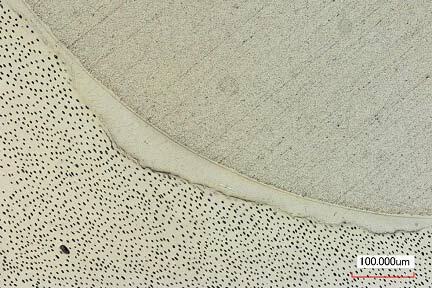 One concern is for the ability of self-etching systems to produce a strong and durable enamel bond. Due to major differences in acidity of the primers, the enamel bonding ability varies greatly among products. Clinical reports in the literature are sometimes contradictory for a particular product. However it is generally agreed that separate phosphoric acid etch and rinse of the enamel will improve the bond of most, if not all, self etching primers. An analogous improvement in dentin bond is not expected since the separate etching will tend to over etch, creating an etched and non-hybridized layer of dentin beneath the hybridized layer4 . 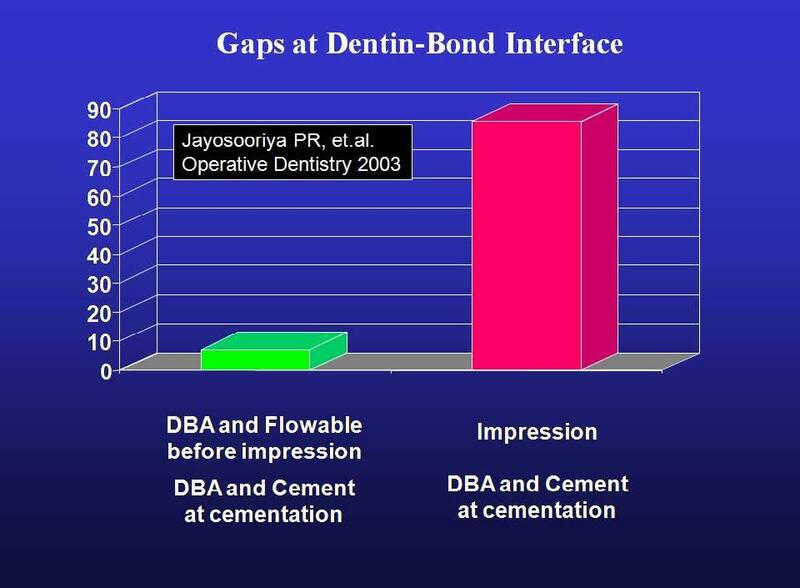 "Immediate dentin sealing" 5,6 for indirect restorations is now being utilized at an increasing rate. As CAD-CAM restorations become more commonly used, another major consideration is the thickness of the bonding layer. For clinical efficiency, it is highly desirable to make the "optical impression" immediately after preparation and then, while the restoration is being milled, apply the dentin bond in a sufficiently thin layer as to preclude blocking the fit of the milled restoration. Since polymerization continues after light curing, applying the dentin seal 30 minutes or more before final bonding (while milling) of the restoration will reduce stresses on the dentin bond significantly. By applying the bond after the optical impression, rather than before, powder removal is facilitated and there is no need to worry about the oxygen inhibited layer on the bond. The last requirement for dream bond, that it be very thin and dual cure, eliminates the majority of self-etching systems. 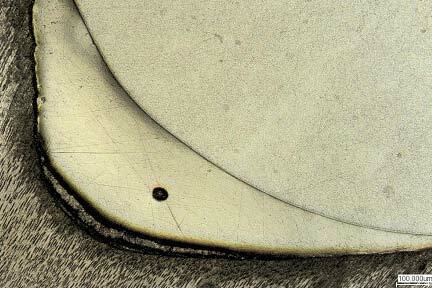 Only two self-etching systems have been observed by the author to be sufficiently thin as to not interfere with fit of CAD-CAM restorations (ex. Cerec), assuming a fit tolerance of 100 microns. These are Bond Force (Tokuyama) and Prelude SE ( Danville ). Most other bonds observed are too thick to meet this requirement (e.g.Clearfil SE Bond). Radiolucency of thick bonds is another consideration. Evaluation of bond thickness in the corners of preparations, rather than on a flat surface (as manufactures usually do), is thought to be more clinically relevant to actual tooth preparations. Prelude SE is a dual-cure bonding agent whereas Bond Force is a light-cure only bonding agent. Use of one bottle Bond Force is easier than Prelude SE but in consideration of the light cure only capability, it may less suitable for use in bonding indirect restorations. 1. Van Meerbeek et al., Buonocore Memorial Lecture. Oper Dent 2003;28:215-235. 2. Relationship between bond-strength tests and clinical outcomes. Van Meerbeek B et al. Dent Mater 2010; 26:100-121. 3. Burrow MF et al., Seven-year dentin bond strengths of a total- and self-etch system. Eur J Oral Sci 2005; 113:265-270. 4. 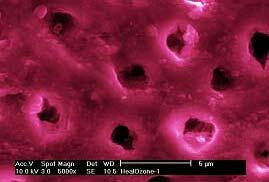 Walker et al., Influence of Additional Acid Etch Treatment on Resin Cement Dentin Infiltration. J Prosth 2000; 9:77-81. 5. Jayasooriya PR et al. The Effect of a "Resin Coating" on the Interfacial Adaptation of Composite Inlays. Operative Dentistry 2003; 1:28-35. One of our past guest lecturers, Dr. Shigehisa Inokoshi, has teamed up with Mr. Matsushige at Tokuyama Dental to produce some amazing images of tooth/bond/composite interfaces. 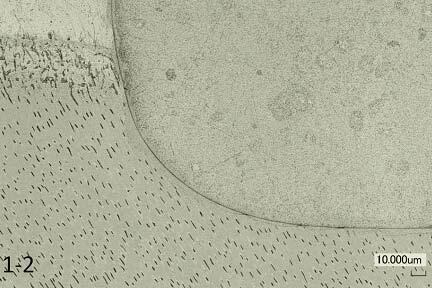 They use laser confocal microscopy which eliminates artifacts that are produced in preparing specimens for scanning electron microscopy. Here are some of the images that I have available (Day 2 seminar stuff). You can see some vast difference in the bonding layer for the preparation corner. Note that the magnification changes to best observe the tooth/bond/composite interface. Let's consider what we can see in the photos. The Clearfil SE Bond is quite thick. The small bar in the corner represents 100 microns. You can see that the SE Bond is a lot thicker than 100 microns. This is not a problem for direct restorations (excepting the possibility of the radiolucent bond layer looking like a void in an x-ray). Kuraray only recommends SE Bond for direct restorations so this thickness is no problem, especially if you thin it by "wicking" with a dry brush as I have recommended for years. The second photo shows Tokuyama's Bond Force which is quite impressive. It is thin and it has an excellent tooth interface. This appears to be the best of the one bottle bonds, by far. Nothing else I have seen comes close. Then comesDanville's Prelude SE. The bar is only 10 microns (the others are 100 microns) which means that Prelude is only about 5 microns thick. Incredible! Since the bond layer is so thin and the bond strength is very high, this one blows away the theory that a thick bond is needed for high bond strength. You can cure the bond before placing an indirect restoration if you use Prelude SE with no worry about blocking the complete seating of the restoration. It will not be seen on x-ray. As to the last two bonds, decide for yourself if you would use them. I reserve candid comment for my seminars. It is truly amazing what differences there are in bonds. These photos serve to illustrate why we should not use "generations" to choose bonds. Bond Force and the last two questionable products are generally considered to be "7th generation".